Music is something we all have in common. It transcends religion, race, language, and even time. 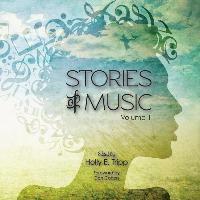 Stories of Music explores an array of experiences with music and how it has impacted people's lives, from its role in healing, community, and family traditions to musicianship, travel, and much more. With works by more than 40 authors and artists from 11 countries, this anthology will take you on a journey around the world through poetry, nonfiction, photography, original music, and videos (URLs and QR codes are provided throughout to direct you to a free companion web edition, where you can enjoy the audio and video pieces). Learn how rock and blues music helped to heal the war-torn country of Bosnia, about the tradition of candombe drumming in Uruguay, and about the history of musicians who travelled on foot--from the balladeers of Victorian England and the Delta bluesmen of the early 20th century to present day musicians who participate in the Massachusetts Walking Tour. Along with these and other stories, this book will introduce you to fascinating people and perspectives; it will make you laugh, cry, and celebrate with the subjects of the stories; and, it will inspire the music lover in you.